A global MGA that handles marine and energy business across multiple geographic regions was experiencing rapid growth. During the last year, its written premium increased 62 percent in just six months. As a result, the MGA needed to better understand the overall functioning of its business with specific attention to mapping processes across multiple locations and divisions, and eliminating steps that didn’t add value. 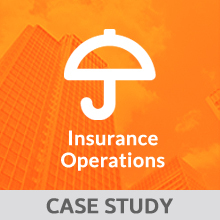 Xceedance and the client created a joint team that included resources from our underwriting, finance, and reinsurance units to cover the relevant insurance lifecycle areas. We divided the project into multiple phases based on business priorities and keeping in mind the goal to standardize underwriting practices across locations. The phases included document management, designing the desired process for credit control, developing outward reinsurance and month-end processing, and connecting all those processes to the existing financial and regulatory reporting function. It has been a complete pleasure to work with Xceedance. We cannot thank you enough for your knowledge, energy, enthusiasm, and focus on results. Well done and you’re always welcome back.